Berichte - Walk Along e.V. Namaste everyone! Our names are Javier and Valentina, a mixed Spanish- Italian couple who have been travelling for 5 months in Asia. We quit our jobs for living a new adventure that brought us from the highest mountain of Nepal to the wonderful beaches of Sri Lanka. We volunteered in Nepal for two months and, for sure, we can confirm that it has been the most amazing experience of the all trip. 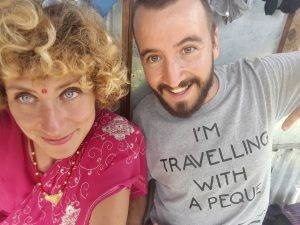 If you are interested in our Nepali adventure, check the article “Our Nepali Life” in the News section and remember: you give a lot, but they will give you even more! “My name is Johanna Boll, and I am an Ecotrophology student. I have been travelling for several months in South East Asia and I am really thrilled to discover new culture and stay close to locals. That is why I am really honoured to volunteer with “WalkAlong” in the village of Karmidanda, especially now, after the earthquake that badly affected the region. I am really glad I can offer my help in such a critic moment and my major focus will be on the school. The school is the centre piece of the village. Education is fundamental to allow each kid to have a future and develop as a man, and that is the reason why we need to fight for it! The village of Karmidanda is located in the Laharepauwa Village Development Committee (VDC) about 100 km north of the capital Kathmandu in the Rasuwa district. The village can be reached by bus and it takes in between six and seven hours, plus 3 hours walk. The route alone gives you a comprehensive insight of the country’s culture, landscape and development, especially if your journey starts on the roof of an overcrowded bus, where friendly conversation are guaranteed! (just a tip: be aware of the tree branches!). The bus trip ends in Kalikasthan. From there you can already admire the mighty hill panorama that will be your constant view from the village. The way to the village, like most of the paths in Nepal, is uphill and you will be immerse in a unique environment: surrounded by numerous rocks, rice fields, lush vegetation, waterfalls, garbage and puddles, sometimes muddy, slippery and at first quite exhausting. Nepalese usually walk with flip- flop or barefoot, but luckily I had my hiking boots. In the village I have been hosted by the great family of Jhabaraj Neupane, a 43 – year – old English – and social science teacher. Jhabaraj was an incredibly hospitable, entertaining and heart-loving person. In the nearly seven weeks I spent in Nepal, we have become good friends. The other family members were the 81-year-old mother Shiva-Kumari, the wife of Jhabaraj, Januka, and the 13-year-old son Awijit. Furthermore, Jhabaraj’s nephew Sambu spent almost every night in the house. The mother, like all the family members, was a very nice person, but it was quite difficult to communicate with her. 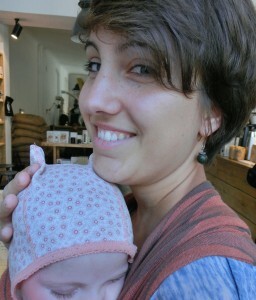 Januka was very nice too and, despite great language barriers, we managed to communicate most of the time. Awijit was very funny and clever and spoke better English than any 13 year old German boy. We spent many funny moments together and after a while he was almost like a little brother for me. The house had, like every house in Karmidanda, a small farm with a goat and cows, and even electric light. In contrast to most of the other houses, the house was somewhat larger, equipped with a toilet building with concrete fundament, a computer with internet, telephone, television and a concrete veranda where the family spent most of the time together. There was also a large mango tree in front of the house, with delicious mangoes in summer. The Shree Navavijayee Mahendra Secondary School was about 20 min. downhill from Jhabaraj’s house. More or less 400 students attended the school and there were usually from 13 to 14 teachers. The school week was from Sunday to Friday and the lessons started at 10:20 am. Before starting school the students completed a quarter-hour early-morning program and sang the national anthem. The school was in a very good condition thanks to a philanthropic Italian named Roberto, who helped the village periodically. The classrooms were large and sufficiently available. The toilets at the first time badly impacted me since there was faecal material all over and crowded with insects. On the same day, however, the kids were so kind and, after my bad reaction, decided to clean the toilets. There was electricity only in the teacher’s room and the classrooms were quite dark when it rained. The children all wore school uniforms, which consist of a blue shirt and a skirt for girls and a cloth trousers for boys. My classes for the 6th and 7th grade started after the holidays in August. I had the feeling that the children understood me relatively well in comparison to the rest of the people, but the communication was not so simple because of my modest language skills and the shyness of the children. The most serious, fundamental teaching impediment, which I noticed right from the beginning, was that the children were incredibly shy! At the beginning I distributed sweets and some of them did not even want to accept my present. On my first day, I asked the children to introduce themselves by saying what were their names, which class did they attend, how many family members they have and what they like most. The children couldn´t speak properly, because they were too shy and they were (also) shy because they couldn´t speak properly. A vicious circle. My first approach was to play games. I played a football game on the blackboard and many children blossomed and overcame their shyness. It also showed that most of them have a very considerable vocabulary. I also started with grammar exercises, but I quickly rejected it since I got little fruitful feedback from the children. Singing songs was a better option and gave a stronger response. With the children and Erin, an American medical student who was visiting Karmidanda for a week, we have translated a Nepalese folk song called “Resham Phiriri” in English. This project took almost a week and was very successful. We have translated every Nepali word together with the children, who have often drawn drawings to clarify the meaning of the word. The children wrote everything, so after a few lessons, everyone had the complete English Resham-Phiriri lyrics in his workbook. In order to improve the oral skills of the children, I have read them stories from their English books but, again, it wasn´t a successful approach. After few weeks I have realized that, all the job done in Germany wasn´t working and I had to think of a new approach. The only instrument I had was a blackboard, and the only way kids would react was speaking all together and not separately. So I thought to do a partner game. Kids had to talk to each other in English about different topics. At first, the game started really slowly but then, when they became more confident, it was really satisfying! On the last day I was solemnly adopted by the whole school with a lot of red colour. It was so emotional. learn some Nepali before arriving and try to improve the language skills during the whole stay! For teaching, use meaningful games. Prepare different teaching materials: take loudspeaker boxes, prepare card designs, etc. Examine songs that result easy for children to sing. be patient and have fun while teaching! The village and life in Karmidanda is something special. Since Nepal is one of the poorest countries in the world, Karmidanda makes a very good impression. The houses are all made of stone and carefully built, almost every house has a small shed with its own animals, electricity and about 10 to 20% of the people can communicate a little in English. Relatively many young people from all over Nepal and also from the village work in low-paid jobs in the Arab Emirates, Israel, South Korea and other countries, which is financially helpful for the respective people and their families, but for the country in the long run probably rather harmful. The village is 1300 to 1400 meters high and is stunning scenery. The people in the village are partly very open and partly very shy towards strangers. About half of the inhabitants are Buddhists and the other half are Hindus. As a stranger one does not get much from the caste system, Jhabaraj always emphasizes that community life was independent of caste and religion. I had also gained this impression, but I also noticed that the caste system matters especially in marriages. Nevertheless, most of the people were very friendly and generous to me and invited me to talk and talk. The immediate village region has two schools, Mahendra and Dunge, as well as a health check point, a tailor and some shops (in one there is also 0.65 l Tuborg for 2 €). The daily routine was relatively quiet, but not boring. Jhabaraj stood up at sunrise and worked in the field, I have always slept longer. At nine o’clock, there was Daal Bhaat, the national dish consisting of rice and lentils, vegetable curry and sometimes Achhar, a sharp sauce. In hindsight, I think I have never eaten as well as in Nepal, because the food is so fresh, everything grows in front of the door. Nevertheless, I took over 5 kg! The school started at 10 and ended after two 45-minute classes, so I got back to the house at 12. In the house around the time there was either nobody or Januka and jhabaraj’s mother, whom I often helped with the corn pelleting and processing. I read a lot or talked to people who often come to the house to talk with Jhabaraj or Januka or just take a look at the foreign guest. Awijit usually did not come back from the Kalikasthan school until 5 o’clock and we often played cards or Karam, a kind of Schnippsbillard. The 24 year old neighbour Shankar was an excellent chess player. I lost seven times against him and could only win twice. Since Erin, the American, spent 1 week in the village, I had a bit more variety. Otherwise you can go for a little walk. For a 200-meter distance you need up to four hours, as you are constantly involved in conversations or invited. At seven o’clock in the evening, there was Daal Bhaat again, then I sat mostly with Jhabaraj and sometimes neighbours on the porch and drunk Roksi, the watery Nepalese liquor and let the day end. I would recommend anyone to stay in Karmidanda! Jhabaraj and his family are excellent hosts, you should help them with some money for the expenses. Even if they would never demand money by their courtesy. Just remind that, while volunteering, the very different cultures should be approached openly and respectfully, and the work at school or in the health check-point should be carried out conscientiously. It was my first time in Nepal, and my first experience was in a really small village. At the end of the summer I arrived in Kathmandu, and the day after I took the bus directed to Kalikasthan. Namaste was the only word I knew at this time. When I arrived in Kalikasthan, Jhabaraj Neupane, the English teacher, came to pick me up. We drank a black tea with milk and sugar, a very common drink in Nepal. After about 45 minutes of walking we arrived in Karmidanda. A small village situated in the lower part of the river “Trisuli”. When we arrived in the house, I got from Januka, his wife, the first Hindu “tika” of my life. A tika is a blessing sign, mostly worn on the forehead. After this exciting day I fell asleep very quickly. They have given me my own huge room with big bed. Just the cat, Kathrina, came to my room. Next day was my first day as a teacher. The way to school took around 15-20 minutes. Just down, down, down. In the village there are no cars, no bikes – nothing except your feet. And this gave me a nice and healthy feeling. Jhabaraj told me: ‘Kids are open-minded and they are curious to learn new things!”. So every day they learned some English from me and I learned from Nepali from them. It was a great experience. I was teaching in 3 classes. First grade 7, followed by grade 6 in the morning time and after lunch I taught in grade 5. We sang songs and played games that they enjoyed a lot. We studied simple grammar in the same way as the word order of sentences and questions, the pronouns, the time or the irregular verbs. In grade 7 we started to read an easy novel – the adventures of Huckleberry Finn in an easy reader issue. It was great to see their smiley faces every day. They appreciate it, they are very friendly and helpful. I would definitely recommend this experience to my friends!